Login or Register with ShopAtHome. 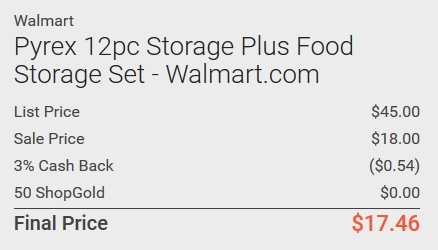 Click the “visit site with rewards” button to automatically open the Walmart.com shopping page. 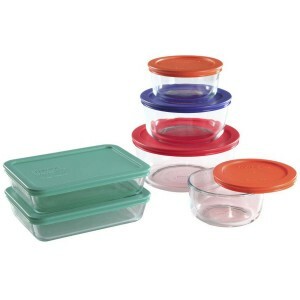 Verify you are looking at the Pyrex 12-Pc Storage Plus Food Storage Set, on sale for $18.84. “Add to Cart” and proceed through checkout. Your 3% Cash Back and 50 ShopGold Rewards on your Walmart purchase will automatically be applied to your ShopAtHome account. Enjoy your Pyrex Set knowing you scored a great deal! 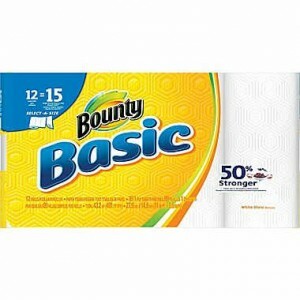 Today ShopAtHome is offering 2% cash back on a 12-pack of Bounty Basic Paper Towels – on sale today at Staples for $7.99 (an $16.99 value). Plus Staples is offering an extra 5% off if you choose in-store pickup today. Click “Visit Site with Rewards” and you’ll be taken to the ShopAtHome Staples page automatically. Verify you’re looking at the 12-pack of Bounty Basic Paper Towels, on sale for $7.99 – look under trending products to find it quickly. “Add to Cart” and proceed to checkout. Choose FREE in-store pickup to avoid shipping fees and save an extra 5%! Your 2% ShopAtHome rebate will post to your account within 30 days. One rebate offer per customer, while supplies last. 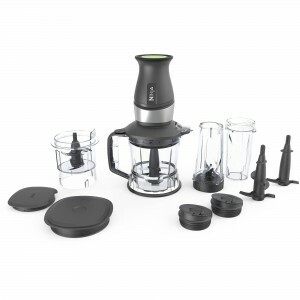 Today ShopAtHome is offering a great $10 Rebate on a Nutri Ninja 2-in-1 (a $119 value – on sale today for $49.97). Your $10 ShopAtHome rebate will apply to your account within 30 days. Click “Get Deal” and you’ll be taken to the ShopAtHome Walmart Daily Deal page automatically. Verify you’re looking at the Nutri-Ninja 2-in-1, on sale for $39.97. Choose FREE in-store pickup to avoid shipping fees. Your $10 ShopAtHome rebate will post to your account within 30 days. The fine print: Offer only applies to Nutri Ninja 2-In-1 in turqoise, red, green, or black. Click the Get Deal button and make the purchase at the price posted on the stores site. Prices subject to change without notice based on retailer site and availability. Limit of one BIG Flash cash back award per deal per ShopAtHome.com Member. 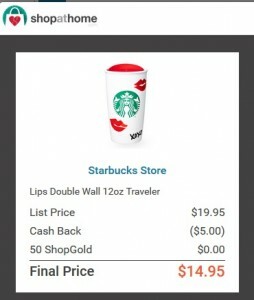 Shop through ShopAtHome today to score this Starbucks Lips Double Wall Traveler Tumbler for $14.95! This tumbler has double wall construction – and the regular price is $19.95. ShopAtHome is offering a BONUS $5 CASH BACK too – today through 7pm EST only. Log in or Register with ShopAtHome. Click the “Get Deal” button to go to the Starbucks page. Then click on your shopping back to proceed to checkout. Pay $19.95 for your Tumbler and get your bonus $5 cash back from ShopAtHome. Enjoy giving or using this great Tumbler! 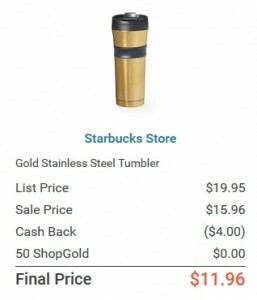 Shop through ShopAtHome today to score this Starbucks Gold Stainless Steel Tumbler for $11.96! This tumbler has double wall construction, a silicone band for gripping, and a shiny gold finish – and the regular price is $19.95. The Starbucks sale price is $15.96 today and ShopAtHome is offering a BONUS $4 CASH BACK too – today through 6pm EST only. Click the “Get More Detailsl” text to go to the product page. Pay $15.96 for your Tumbler and get your bonus $4 cash back from ShopAtHome.